Archive: Spring 2011 | Spring 2010 | Fall 2012 | Fall 2011 | Fall 2010 | Fall 2009 | view all previous semesters . . . This is an archive of all resources related to my courses at Miami University. Click each class for a list of all documents accross all semesters. 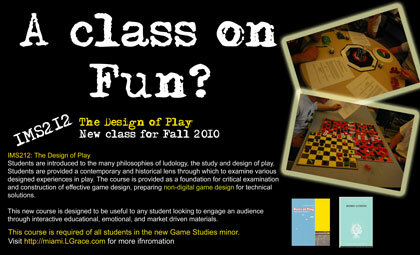 Students are introduced to the many philosophies of ludology, the study and design of play. Students are provided a contemporary and historical lens through which to examine various designed experiences in play. The course is provided as a foundation for critical examination and construction of effective game design, incorporating analogue game design for technical solutions. The course is designed to be useful to any student looking to engage an audience through interactive educational, emotional, and market-driven materials. This course is required of all students in the new Game Studies minor. Recent press: Game Studies Minor gaining momentum | Miami University Princeton Review's Top 50 . . .
Prototypes are becoming the way to sell your idea. Whether it’s an art installation, a brand new idea in video game design, or a website that breaks convention, good digital prototypes are your proof of concept. This creative course helps artists, scientists and everyone in between learn to build effective prototypes that demonstrate and test your ideas. Students will learn a variety of rapid prototyping techniques, building a variety of self-designed projects. 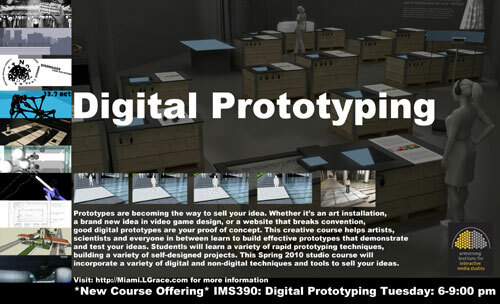 This Spring 2010 studio course will incorporate a variety of digital and non-digital techniques and tools to sell your ideas. 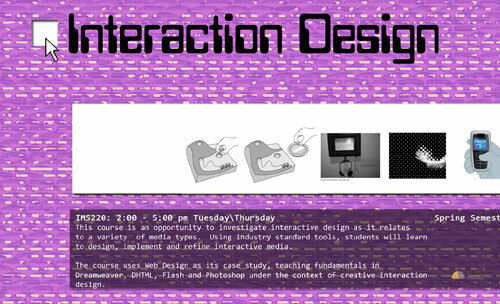 This course is an opportunity to investigate interactive design as it relates to a variety media types. Using industry standard tools, students will learn to design, implement and refine interactive media for specific audiences. For the purpose of this class, interactive media includes websites, menu systems, and the variety of software and hardware solutions that intersect the domain of human-computer interaction. Effective interactive design is often achieved by the creative application of sometimes disparate disciplines. Students should expect to incorporate their understanding of art theory, psychology, commercial business practice and good old fashioned creative problem solving. This course develops theoretical foundations, methods and skills in building gaming environments. It serves as both a survey in game design and a practical introduction to computer game production. Students will design and develop a game of their choosing under the general supervision and guidance of the instructor. Game design sits in that ephemeral space between the practical sciences and the imaginative arts. As such expect both sides of your brain to be taxed as we discuss and develop computer games. Good game designs intersect computer science, psychology, art and a little bit of magic. Depending on the prior training and experience of class members, emphasis will be placed on 3D game development or the design and communication of a complete game. Archived Semesters . . . Recent press . . .
Game Studies Minor gaining momentum . . .
Miami University Game Program in Princeton Review's Top 50 . . .
IMS212 The Design of Play: Students are introduced to the many philosophies of ludology, the study and design of play. Students are provided a contemporary and historical lens through which to examine various designed experiences in play. The course is provided as a foundation for critical examination and construction of effective game design, incorporating analogue game design for technical solutions. The course is designed to be useful to any student looking to engage an audience through interactive educational, emotional, and market-driven materials. Gallery of midterm projects for IMS222, Interaction Design are here . . . Please note: Class will not meet on 10/28 and 11/2. Class will resume on 11/4, with the presentation of your paper prototypes and your final game design document presentation. Our makeup session will be Sunday, November 8th. Please note: Class will not meet on 10/29 and 11/3 as scheduled. Instead you will visit King 30, for usability training on 10/29 and your own study on 11/3. This document is an archive of resources provided by Lindsay Grace, an Armstrong Professor of the School of Fine Arts and Armstrong Institute of Interactive Media at Miami University. The resources provided here concern undergraduate level instruction in art and design for the commercial arts. This includes video game art and design, web design, film making, and commercial writing. These resources are to be used by students in fine arts classes and interactive media studies. The use of materials not written by Lindsay Grace, if any, are provided within the definition of Unites States of America "fair use laws." Any third party content is provided with the understanding that it meets all local, state, and federal copyright restrictions. Please provide credit to author when linking or using these materials. Some links may be broken. You may also be looking for my old class resources for courses I taught at the Illinois Institute of Art or presentations I have made at varied venues.